Advancement in digital technologies has disrupted everything, including leadership styles, according to Barry Libert, Jerry Wind and Megan Beck Fenley. Employees want more ownership rather than to follow instruction; customers want to participate in the marketing and development process; and leaders are finding that open and agile organizations are able to maneuver more effectively than organizations where “all insight and direction comes from the top. In short, the autocratic Commander, whether brilliant or misguided, just won’t cut it anymore,” they write in this opinion piece. So what is a leader to do given this new digitally enabled and hyper-connected environment? Employees and freelancers (such as Apple’s developer community) want ownership, impact and recognition, rather than to follow instruction. Customers want to participate in the marketing and development process (witness how consumer/business relationships have grown on social media and the rise of crowdsourcing businesses like Victors and Spoils), rather than be told what they want and why. Leaders are finding that open and agile organizations are able to respond faster and more effectively to these developments than organizations where all insight and direction comes from the top. In short, the autocratic Commander, whether brilliant or misguided, just won’t cut it anymore. Leaders need a broader range of style options to match the broader range of assets companies are creating today. In our business model research, based on financial data from the S&P 500 companies, we found that Network Orchestrators — companies that invest in intangible assets, like relationships with customers and suppliers (Facebook, LinkedIn, Airbnb, TripAdvisor) have the highest Multipliers (price to revenue ratios) at an average of 8x (more details here). These value premiums result from rapid growth and low scaling cost, as noted by Jeremy Rifkin in The Zero Marginal Cost Society. Further, we identified that the different leadership styles complement some business models and detract from others because each business model leverages different types of assets, which perform best under different leadership styles. The Commander sets the goal and tells others how to accomplish it. This works well with machinery, which happily does what it is told, and with direct subordinates who prefer to simply execute. It is less effective with employees and customers who want choice and participation. The result in today’s world is high marginal costs and little participation and buy-in. This style is most suited to the production of manufactured, commoditized goods as it is limited by the Commander’s vision and bandwidth. The Communicator also sets a vision and a plan, but communicates it in order to inspire and create buy-in. This works better with employees and customers who want to at least understand where “the firm is headed.” It enables them to take action in line with the leader’s vision (it scales effectively), but it does not encourage innovation. This style is suited to services firms where all employees must work to fulfill the mission. The Collaborator works hand-in-hand with customers and employees (be they full time, part time or independent) to achieve the organization’s goals. As a result, it is empowering and enabling. This style taps into the innovation of people and drives the creation of new intellectual capital. Great examples are open innovators such as Victors and Spoils, a collaborative ad agency and Merck with its crowd-sourcing competitions. The Co-Creator allows other stakeholders to pursue their individual goals in parallel with the goals of the organization. As a result, he or she drives both rapid scaling (due to the high level of participation) and innovation. This style is at the heart of network companies where value is shared by the company and the network participants, such as Airbnb, Uber and Innocentive.com. Commander: Jobs often had a specific vision for design that he would insist on. Communicator: Jobs’s inspiring keynote presentations are legendary. Co-Creator: Jobs eventually built a developer network that is unprecedented. 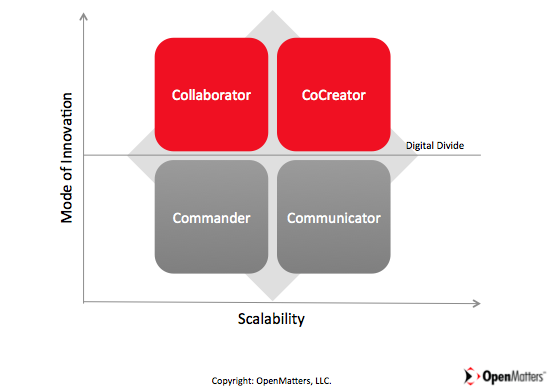 For Jobs, and for many leaders, co-creation can be uncomfortable. Given that network-based businesses are the most highly valued and profitable companies in today’s digital world, what does it take for a leader to co-create? Our answer: the ability to relinquish control and the willingness to share the value created with the crowd. When Jack Dorsey and his collaborators developed Twitter in 2006, employees of their startup used it internally. As co-founder Evan Williams described it, “There was this path of discovery…. Twitter actually changed from what we thought it was in the beginning.” They had no idea the role it would play in sociopolitical movements, pop culture and business until the network actually started using and forming it. Although it may be difficult for founders to allow the network to shape their creation, that is the path to creating the most valuable, and valued, tool. The same is true for companies like Airbnb, Etsy and Uber that actually share revenues with their partners. Their business models depend on the enthusiastic engagement of their partners (hosts, creators and drivers). But these multi-billion-dollar start-ups are not the only companies that use this new leadership style. So do established companies like Visa and MasterCard, stock exchanges and those that rely on open-source development, like Red Hat Software. These businesses survive and grow because of the participation, co-creation and co-ownership of their members. If you are a leader of a traditional company or industry, you may be thinking that Co-Creators are great for digital start-ups, or even existing membership based businesses, but not really applicable to you. Co-creative business models are growing at faster rates, are more profitable and more scalable than those that rely on proprietary, in-house solutions and people (see What Airbnb, Uber, and Alibaba Have in Common). In the end, the argument for leaders to co-create is an argument for profit, growth and value creation. Today, the most valuable assets are intangibles: relationships (with employees, customers and investors), knowledge (ideas) and people. The newest business model, Network Orchestration, taps into these “assets” at low or near-zero marginal cost of scaling, resulting in rapid growth, higher profit margins and, ultimately, greater investor returns. Remember that your firm already has dormant networks of customers, employees and partners that want to share in value creation, and are already doing so with other firms. They are an enormous asset, but one that cannot be tightly controlled, even by the best executives. Only leaders who are able to relinquish some control and share the rewards will be able to access the value that these groups have to offer. Understand your innate preferences. Everyone is naturally inclined to a particular style of leadership. Assess your own capability with each of the four leadership styles. Take a test at www.digitalgrader.com/leadership-survey. Find mentors to support your development. Seek out leaders with strengths in this new style of leadership. It is hard to change without support, and mentors provide external perspective and give practical ways to change your approach. Reverse mentoring, where younger employees advise the leadership, is also a great option for leaders coming up to speed on new digital technology and cultural shifts. Experiment with new business models: Dedicate yourself and your team to regular exercises and workshops that hone your co-creation skills. Begin to experiment with co-creative, network businesses by investing some of your capital into business initiatives that require co-creative leadership. Create measurable goals for co-creation. Successfully co-creating looks different than successfully commanding. Update your personal and leadership team objectives with appropriate indicators: customer or employee engagement, participation, loyalty and co-creation. It will keep you on the straight and narrow. Remember, every one of us possesses a “portfolio” of leadership styles and each one has its place. A surgeon may be a Commander in the operating room, a Communicator with patients and a Collaborator when performing research. 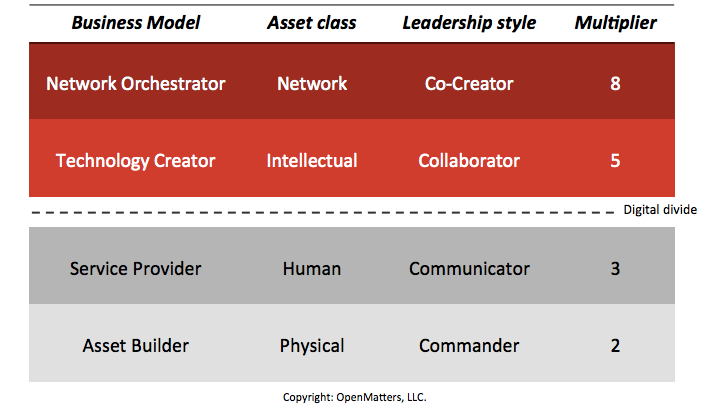 However, the styles that created value for many leaders decades ago are less effective with today’s empowered stakeholders — and since 95% of companies are not Network Orchestrators, we suspect that most leaders lack strength at co-creation. The digital, cultural and asset revolution provides a fantastic opportunity for shared success — increased growth and profit for businesses, and increased value for customers — but creating network-based businesses will require openness, adaptation and the development of new leadership skills. Barry Libert is CEO of OpenMatters and a senior fellow of the SEI Center at Wharton; Jerry Wind is director of the SEI Center and a marketing professor at Wharton; and Megan Beck Fenley is a digital consultant at OpenMatters and researcher at the SEI Center. American psychologist Abraham Maslow is best known for his seminal research on the hierarchy of innate human needs, but his work also has a surprising application for businesses models and shareholder value. Actually, I have to question if there is truly a shift in leadership style or if it is a structural economic shift? In my view, leadership styles don’t really change with time but are adapted to changing times. Since the Industrial Revolution and up until the Oil Crises of the 1970s, economic development focused on production. This period was dominated by large organizations in which everything they needed was under one roof. This was the most efficient way to produce. In the 1980’s, I’d argue in response to the Oil Shocks, Western leaders, like Reagan and Thatcher, sought to desensitize their economies to these resource risks through a wholesale shift from production to consumption. The rise of distribution giants like Walmart and Tesco, Carrefour and Metro, attest to this shift. Likewise, the development of the Internet facilitated globalization by making communication and collaboration between productive entities possible. This allowed these large product-based organizations to focus on a core business while shedding non-essential functions to service providers off-shore as well as on. Today’s most valuable Internet companies are those which facilitate relationships between economic actors as duly noted in this article. However, one must also consider that in order for this new economy to occur it needed to be accompanied by a legislative and financial framework that made it easy for companies to shed non-essential functions and just as easy for those with an entrepreneurial flair to start companies that provided those function no longer to just one company but to many. It is this movement of creative-destruction that produced the significant productivity gains experienced in the first decade of this new century in many countries. But not all. In my view, it is from this point of view that we can best understand the “austerity” policies pursued by many European countries since the Financial Crisis of 2008. These policies have sought to create economic opportunities within these countries which unlock these productivity gains. Unfortunately, the political and economical structures don’t make it easy. The pandering to the status quo throughout most of the peripheral European countries has allowed them to shed a number of functions but never put in place the mechanism to easily create new economic actors, leading to high levels of unemployment. So, yes, I agree with your observations but attribute them to a much more fundamental shift in economic models within an historical continuum.